Vectorworks has acquired Design Software Solutions, a long-time reseller of Vectorworks software. The Vectorworks UK office will build on the support, training, and sales infrastructure developed by Design Software Solutions as a launch pad for further development in the region. The new office will be led by Tamsin Slatter and Adrian Slatter, former directors of Design Software Solutions. 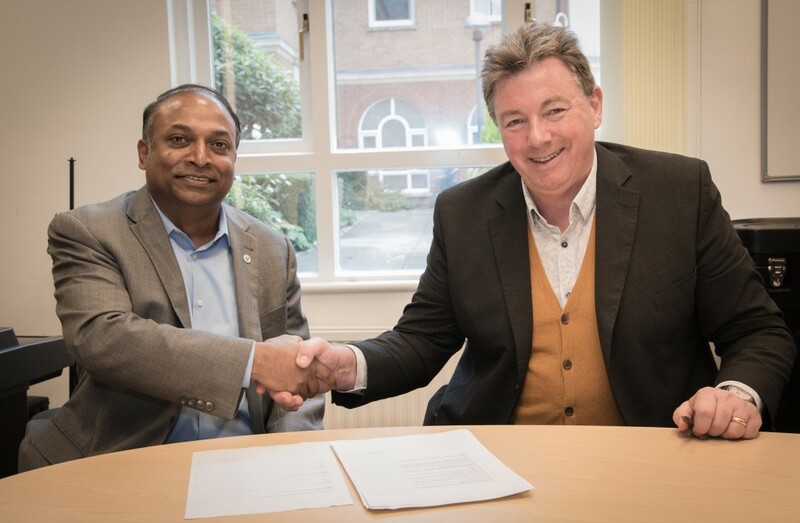 Vectorworks CEO Dr. Biplab Sarkar and UK Sales Director Adrian Slatter. Photo courtesy of Jason McCutcheon, JMcC Photography. “We’re thrilled to be part of the Vectorworks team. The UK and Ireland is a major market for designers of all disciplines, and Vectorworks’ decision to invest in creating a direct presence shows how highly the company values these clients and the market opportunity that exists,” said Adrian Slatter, UK sales director. Questions? Please click here for more information about the Vectorworks UK office.